In this sequel to Weiner's Good In Bed, we find Candace Shapiro and husband, Peter, married and raising preteen daughter, Joy. While Cannie is attempting to move forward with her writing career, Joy starts to question everything, including her mother's first book and wants to spend more time with her father, Bruce, as she turns into a quiet and rebellious teen. Then Peter decides he wants to have a baby, throwing yet another curve Cannie's way. Can she juggle it all, curbing Joy's rebellion and then try to do it all over again? I absolutely loved Good in Bed which is one of my favourite chick lit books so was worried about the sequel, but found that Certain Girls did not fall short. I loved it just as much and I was definitely not disappointed. I did find the alternating narrative distracting at first, but once I got used to it, I was hooked. I thought Cannie’s journey with her daughter was touching and moving and the insight into a thirteen year old girl’s mind was interesting not to mention frightening, and so much like I remembered it! Although Good in Bed made me laugh frequently right from the start, I found that Certain Girls didn’t make me laugh out loud until I was well over 100 pages in, and then the laughs came frequently, until of course the tears (I am a sap, and cry at most things). The ending was not what I expected, which was a pleasant surprise. Anything too predictable becomes boring, so I enjoyed this. The plot moved along quickly and I enjoyed the story that unfolded and really cared about the characters, all of which are signs of a great book. My rating is 5 Stars and it is now one of my favourites. I found it irresistible, not to mention incredibly hard to put down, and is a roller coaster of laughter and tears that only Jennifer Weiner can provide. 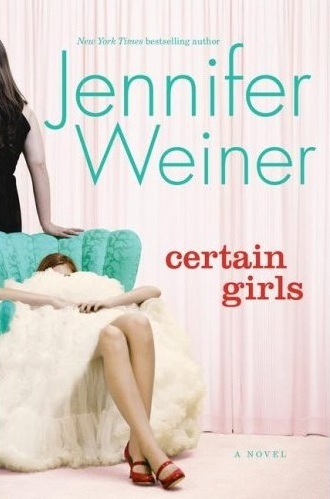 Certain Girls is the sequel to Jennifer Weiner’s Good in Bed and I think I enjoyed it more than the first - which I’ve found is not always the case with sequels. There is just something about the way Certain Girls is the story written from both the perspective of the mother and her daughter (now 13!) that appealed to me from the beginning. Perhaps I related to Cannie as a mother as I have just had my first daughter and am already trying not to panic about raising a teenage girl in a few years time! Strangely enough, despite the bizarre thoughts we read of the daughter’s, I actually think I was calmed a bit and made me think about how I can try to be a better mother to a daughter. It’s also made me appreciate my own mother more! Certain Girls made me laugh and made me cry and made me incredibly frustrated a times. Then again, who knows what their kids are up to? My parents didn’t always know! And I was a good kid! Mostly. This is one sequel that is certainly worth the read. I have read all her books and she never disappoints. they are all so readable. She is always spot on and relatable..when writing of relationships.